Election endorsements are a tradition here at The Gray Report. One of this country's biggest problems is that we don't talk enough about issues. It's how we end up at extremes, unable to compromise. So please, feel free to comment, but let's be civil. California has an odd system in which the best two candidates, regardless of party, make it to the fall general election. In a Democrat-dominated state, that means we'll see some of these choices again in five months. It also means a lot of voters will sit this one out, which is a shame because there are some important and interesting ballot measures. To make these endorsements, I read the suburban-leaning endorsements of the San Francisco Chronicle, the poorly programmed page of the Los Angeles Times, the namby-pamby "we like him ... and her too!" endorsements of the Sacramento Bee, and the voter info at SmartVoter.org. I want to single out for praise the best endorsement publication in the state, the San Francisco Bay Guardian. The Guardian is well to my left, but even after an ownership change, this weekly paper does the work of interviewing all the candidates, even in minor races, and explains its position well. Whether or not you agree with its politics, the Guardian's endorsements are indispensable. What an amazing third act Jerry Brown has pulled off. At age 36, he was a hereditary governor, winning on the legacy of his father. 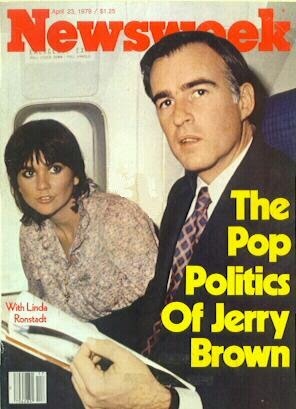 Brown was labeled "Moonbeam" by his girlfriend Linda Ronstadt. When he lost a Senate race in 1982, he disappeared. A decade later he ran second to Bill Clinton in a bitter fight for the presidential nomination, and refused to endorse Clinton in the election. He got back into politics in 1999 by taking a job no sane politician would want, mayor of Oakland. He ran as an independent and disavowed a lifetime of liberalism, disappointing many in that city, but also giving Oakland what nobody expected in the mayor's office (or has had since): a grownup. He served one term as California Attorney General, and in 2010 ran for Governor again. Totally rehabilitated in the eyes of the California Democratic party machine, he had no real opposition among Democrats and did little campaigning. We didn't know what we'd get. Much like Oakland, we got a low-key pragmatist. Brown passed a budget with the kind of deep social-services cuts that Arnold Schwarzenegger talked about but couldn't pull off, and also raised taxes to close the budget deficit. He exercises power without celebrity. He makes us do what we should. For a guy who was a hereditary celebrity governor, it's incredible; it's as if Joffrey became a good King. The part-owner of Cade Winery got the endorsement of the Guardian, which always hated him when he was mayor of San Francisco. This office is mostly ceremonial anyway, and I'm happy to see a wine lover in it. This is the office Leland Yee was running for before being busted on corruption charges, throwing open an interesting race. Now registered as an independent, Schnur chaired the Fair Political Practices Commission and was director of USC's Institute of Politics. He was previously a Republican spokesman and strategist and worked on John McCain's 2000 presidential campaign. The Secretary of State is California's chief elections officer. Schnur has easily the most credentials of the candidates to do this job. His experience with McCain fighting against unfounded rumors is a plus. A member of the state board of equalization, Yee got the endorsements of both the Guardian and the Chronicle over John Pérez, speaker of the California Assembly and Ashley Swearengin, Fresno mayor (who the LA Times likes). It's a concurrence, not an agreement, and an interesting one. The Chronicle chooses Yee for her more specialized knowledge for the job at hand, of overseeing state spending. The Guardian mentions a story by the Center for Independent Reporting that questions Pérez' ethics. Lance Williams, the CIR reporter who broke the story, once worked for the Chronicle, investigating the BALCO steroids scandal that embroiled Barry Bonds. But the Chronicle doesn't mention his story about Pérez at all. I make this rant every election. How can we be expected to know who to choose in a down-ballot race like this? The SF Chronicle, LA Times and Sacramento Bee don't really need to endorse a US president or California governor, because we can make up our own minds from the extensive coverage. This is exactly the kind of race where they should pick a candidate. Yet none of them did. Thanks to the Guardian, which explains Chiang's work as state Controller and endorses him. Sounds good to me. She's a grandstander in a springboard role for politicians with opinions and ambitions. Don't be surprised to see her running for governor in four years. This year she has no serious opposition for re-election. I'm not sure how much of Covered California's balkiness can be laid at the incumbent Jones' feet, but he has no serious opposition, and he has been activist in forcing Uber and Lyft to shore up their insurance on their independent drivers. And I believe he was a founding member of the Monkees. As head of LA schools, Tuck waived seniority in making staffing and layoff decisions for teachers. Tom Torlakson, incumbent in this office and his opponent in this election, filed a court action to block it. That's really all you need to know to decide. Teachers' unions resist performance evaluations as a matter of course and kids' educations suffer for it. I'm not a fan of expanding charter schools, which is where Tuck got his start, because I think we should put our resources into making the public school system better for everyone. We can't do that by giving "social promotions" to teachers; they need to be graded too. I can't believe political fixer Fiona Ma has the support of the Guardian. And I can't believe I'm going to echo it. I wanted to endorse Republican candidate James Theis, listed as an "organic foods manager." But he doesn't really exist. He doesn't have any real description at Smart Voter, didn't respond to the Sacramento Bee's questionnaire, and Bay Area GOP.com doesn't know anything about him except that he entered the race to support "the little guy." There are only two candidates, so he will be on the ballot again in November. If they can find him. Only an idiot votes against the party leader in Congress when that leader represents one's own district. It's all about the bacon, in this case vegan fat-free bacon. This is the most interesting race in San Francisco and will be recontested in November, so I have time to reconsider. Chiu is president of the city's board of supervisors and has presided over an unusually peaceful era for that board, in part because he is not as doctrinaire liberal as his opponent here, fellow supervisor David Campos. I can make a case for either to represent the city in Sacramento: Campos will probably more reliably represent the city's values, while Chiu is more likely to work with others. Given Sacramento's dysfunction even under complete Democratic control, I value cooperation more. Flores, a civil rights defense attorney, has an unusual trifecta of endorsements from the Democratic, Republican and Green Parties. I don't know what the Chronicle is thinking by endorsing mediator Carol Kingsley. Kingsley's husband was killed in a high-rise massacre in 1993 and she became a crusader for tougher gun-rights laws. Sad and admirable. But she told the Chronicle that she would consider recusing herself in gun violence cases if the defendant asked. Also admirable. But come on, she's basically admitting she can't do the job. This would repurpose $600 million in unspent bonds in the state's veterans home loan program to build transitional housing and services for homeless military veterans. It isn't free; it will cost the state $750 million over 15 years, about $50,000 each for California's estimated 15,000 homeless veterans. And really, the federal government should pay for it. But given the high percentage of those homeless veterans who end up begging on San Francisco streets, and getting whisked to our emergency rooms, we need to exercise not just compassion, but sensible use of funds. This proposition requires local governments to respond to public records requests while not promising that the state will reimburse them for the cost of doing so. At first glance it seems odd, but think about police and fire services: local governments have to provide those with or without money from the state. This puts providing public records on the same level. We just had a San Francisco politician busted on a set of corruption charges so wild that Netflix would reject them as a plot development. Of course we need public records access. It's seismic retrofitting, we have to do it, whether we like the $400 million bond cost or not. This is the toughest choice on the ballot, and the only one I spent days chewing over. The proposition would require voter approval for any development on Port property that exceeds the height limits currently in force. This comes after the bitter fight last year over a proposed tall development that would have blocked the view of a pair of condo owners, who had enough money to fund a successful ballot initiative to prevent it. I hate ballot box regulation like this, but I voted to block the development last year and I'm voting for this. Height restrictions are in place because we like the waterfront open. The Board of Supervisors can consider a variety of issues when deciding to exceed them, and not all are the political contributions they receive for doing so. Sometimes the new development might offer more open space or affordable housing. But these decisions are always made on a by-the-project basis, not with a longer-term worldview on what we want the waterfront to look like in 2040. There was a time when one could say we had a housing shortage. Now, though, there are construction projects everywhere. We as a city proved last year we like waterfront height restrictions. That case was specific, and not the best test case either, but still. Waterfront views are a legacy for the city and we shouldn't allow short-term supervisors to make decisions on them without a full public hearing. If we as a city didn't want last year's waterfront development, odds are we won't want next year's either. When the city wanted to take out 150 parking spaces to make yet again more bike lanes in my neighborhood everyone reacted. I went to meetings with long time residents, seniors, the disabled, business owners and even cyclists who argued this was not the right move. David Chiu attended and refused to take a stand on the issue. We wrote, we emailed, we called. He didn't respond. And we are from his district! Not even a form letter. So don't believe it when anyone tries to convince you that Chiu works well with others. He doesn't even work well with his own constituents. I will never, ever vote for him again.